Dr Graves and the Ringmaster try to hold down the morning show while everyone waits for word from the missing JJ. Then, JJ visits a DC VIP with strange and nerve-wracking results while Major and Abby try to get her probed by the Ringmaster much to Dr Grave’s chagrin. Douglas Skrief as Dr Graves, Justin Kapla as The Ringmaster & Mr President, Aela Mackintosh as Abby, Jeffrey Adams as JJ, Tom Bement as ... See More Major, Caleb Silvers as Ned Nedly, and Beth Lowthian as Diana. Other voices by the talented cast. Script, direction and post production by Jeffrey Adams. Some Sound effects from the Freesound Project at Freesound dot Org. The Radio Icebox theme song was written and performed by Myron Hawrylak. 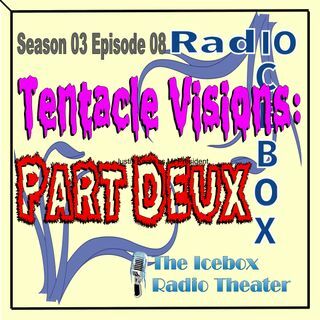 Radio Icebox: Season 3 is made possible in part by the voters of Minnesota through a grant from the Arrowhead Regional Arts Council, thanks to appropriations from the Minnesota State Legislature’s general and arts and cultural heritage funds.